Crash victims benefit from Accident Scene Management classes | Hupy and Abraham, S.C. Accident Scene Management, Inc, has been teaching motorcyclists how to react at the scene of a motorcycle crash involving injuries since 1996. Thousands of students have learned what to do until professional help arrives and some have saved lives after taking this informative class. ASMI founder and director, Vicki Sanfelipo, wrote the program after attending a Governor's Conference on Highway Safety in Wisconsin. ABATE of Wisconsin invited Slider Gilmore to speak at this conference and his "Two Wheel Trauma" lecture inspired Vicki to create a teaching class based on the U.S. Department of Transportation's First Responder curriculum. Vicki developed Basic, Advanced, Refresher and Professional modules for Accident Scene Management in addition to an Instructor's Certification program. It quickly became apparent that the demand for this type of training around the country was more than Vicki and her core group of Wisconsin instructors could handle. She now has instructors in 26 states and also in Australia. She's going back to Australia this spring to teach and certify more instructors and has been asked to bring the program to Hawaii this year also. 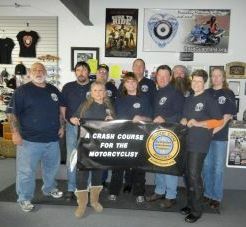 One direct result of ASMI training was the formation of Rescue Riders in Illinois. Dean Akey, St. Charles, Illinois, and a group of his friends formed Rescue Riders as a way to utilize the training they received from ASMI. Motorcyclists with ASMI and CPR training can join Rescue Riders which provides trained volunteers to assist at different events and during motorcycle rides, attending to any medical emergencies until professional help arrives. Rescue Riders has also gone national. February 24-27, 2012, instructor trainees attended certification classes at the Road Guardians Compound in Big Bend, Wisconsin. To become a lead instructor for ASMI, you must be an EMT-B or higher. The new instructors will take these classes back to Indiana, Illinois, Missouri, Minnesota, Iowa and Arizona. New ASMI instructors from left to right: front row, Director Vicki Sanfelipo, Catten Ely, Minnesota; Bruce King, Missouri; Mary Ann Summers, Illionois; back row, Mitch Levy, Arizona; John Smith, Iowa; Greg Tish, Iowa; Chip Smack, Missouri; Dave Hollendsworth, Indiana; Lucinda Robinson, Indiana. The new instructors were given all the tools needed to teach ASMI classes in their home state. In addition to learning the administrative skills needed to start an ASMI program back home, they also participated in a Basic and Advanced class series taught by Vicki for some Wisconsin ABATE members. Students learned basic skills dealing with maintaining an airway, how to stabilize the cervical spine and how to control bleeding. They practiced these skills along with full face helmet removal and how to move an injured person and when that might be necessary. The advanced class dealt with medical issues and how to assist professionals at the scene of a crash, and much more. Student Laurie Thompson demonstrates excellent technique in removing this full face helmet. Vicki is currently working on a "Best Practice" protocol that she hopes will be embraced by the Wisconsin EMS. Her goal is continued educational training with an emphasis on motorcycle specific issues that are not currently addressed in EMT courses and EMD (Emergency Medical Dispatch) training. Hupy and Abraham has been a financial supporter of Accident Scene Management since its inception and continues to support and sponsor Accident Scene Management, Rescue Riders and Road Guardians. These organizations are making a possitive impact on the motorcycle community and it is the hope at Hupy and Abraham that more people receive this training and decide to join Rescue Riders and Road Guardians.